Fun fact about carbon dioxide: Trees “breathe” it and exhale oxygen. So that should keep everything in balance, right? Maybe at some point in the past, it did. Folks, I don’t care what you happen to believe. Sure, global climate change events happened in the past, before the Industrial Revolution. We refer to them as the “Great Extinctions.” You might not believe we’re experiencing one now. Coral begs to differ with you. You might say “OK, it’s happening, but it’s not being generated or accelerated by humans.” Coral begs to differ with you. Coral would like you to know it is time to be terrified. So would the folks who made Chasing Coral. Let’s get the review piece out of the way, because in this case it isn’t really the point. The film tracks a crew of dedicated coral-nerds who are trying to capture a “coral bleaching” event (mass death from overheated water) so they can start making the public pay attention to what’s going on beneath the ocean’s surface. There’s some beautiful underwater photography, both still and moving, of corals—healthy coral reefs look like they were drawn by a Finding Nemo animator at Pixar, and they are stunning. On the whole, the documentary is not a blazing artistic groundbreaker. And it isn’t meant to be. It’s meant to get you tuned in to the fact that while everyone’s talking about the impact of global warming as if it were something still in the future, ocean temperatures are now regularly experiencing what used to be extremely exceptional random events—namely, “fever” temps that cause coral to die. Now. In real time, and quickly. It doesn’t take generations; it takes weeks. It’s happening right this minute and all over the parts of the planet populated by coral. You don’t want to know how many cutting edge pharmacological products (including cancer-fighting drugs) come from compounds found in coral. Reefs provide food for a hell of a lot of humans, and significantly, barriers against things like, oh, say, tropical storms and hurricanes and tsunamis. Which isn’t going to become less of a thing in your lifetime, by the way. Without coral reefs, we lose many important creatures we currently depend upon for protein. Australia’s Great Barrier Reef generates over $1.5 billion a year in tourism and fishing, so the economy’s a thing, too. I recently had the pleasure of hearing the poet Camille Dungy give a lecture that centered on the use of coral as a device for measuring not only the last million or so years of climatic events, but also time and our perception of it, based on shifts in our planet’s distance from the moon. (Google it, it’s wild.) Coral’s not just an architect of massive underwater cities whose exports we need—it is also a diligent historian. Without it, we lose an incalculable amount of information as well as one of the planet’s most important ecosystems. Coral bleaching doesn’t always mean immediate death, but it makes it extremely likely. It’s possible for corals to bounce back from a single bleaching event, but repeated exposure of weakened corals to overheated water is a death sentence, and often a swift one. Chasing Coral is not intended to be an artwork, though elements of it are artful enough. It is explicitly a public service announcement, and a call to action. We tend not to spend much time thinking about things like corals, because they live in a place we don’t usually see (unless we’re lucky enough to live near a reef). What goes on under the surface of the ocean might not seem that connected to what’s going on here on land, but that’s an illusion. Corals would like you to know that you and they are connected far more directly than you imagine, and that without them, you face a radically destabilized environment. Is it too late? Have we already guaranteed the extinction of corals and thus the extinction of the vast numbers of species with whom they share a symbiotic relationship (which, by the way, includes humans)? These guys don’t think so, but drastic action on the carbon dioxide front is required pretty much right this minute (and pretty much fifty years ago) if we want ocean temperatures to return to a range in which these crucial animals can survive. There has been mass coral death all over the world, much of it in just the last few years. There is already no point to debating our role in causing the conditions that have prompted it. It’s time to band together and give the oceans whatever chance we can possibly give them to cool off a little. So I strongly recommend watching Chasing Coral, after which I urge you to please log the hell off and unplug the freaking television. Because seriously, folks. You don’t want this. 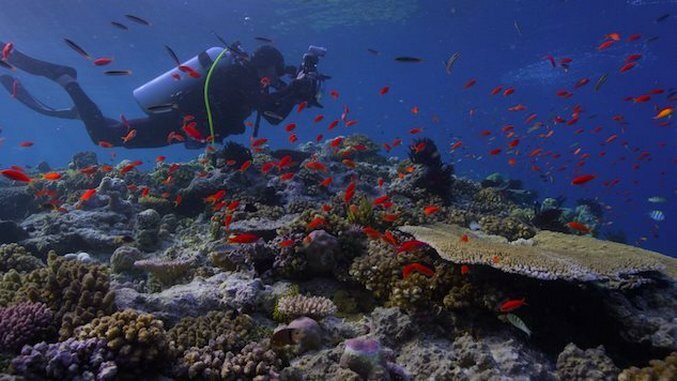 Chasing Coral is now streaming on Netflix.